Cars buses, planes – most of our transport systems rely on tyres. Most of our food and consumer goods is delivered by truck, hence our reliance on tyres to smooth the way is immense. We all know what a pain it is when we get a puncture – but what happens when we come to change our tyres? Tyres are made from vulcanised rubber. This is a very tough form of chemically enhanced rubber. This material contains highly toxic, both for humans and the environment, substances, and is a potential fire hazard. When incinerated, tyres produce a lot of pollutants which are dangerous when released into the atmosphere. When put into landfill, tyres take a considerable amount of time to break down. One option for dealing with used tyres is a process called retreading. This is a process that replaces the tread section of the tyre, that has the continued traction with the road, or the entire outer surface of the tyre. Within the UK, truck tyres can be retreaded up to 3 times, and car tyres just once. These procedures are strictly regulated by the Government. Within the UK, 50% of truck tyres, and currently all aeroplane tyres, are retreaded, but this practice is declining, mainly due to budget tyres, produced cheaply overseas, flooding the market. Some landfill companies are now operating a tyre chipping scheme. Tyres are brought to the landfill site in bulk from recycling centres, and are cut into chips or granulated. This can then be used in a variety of ways – as carpet underlay, as a soft cushioning material for children's play areas, or reprocessed further, and used to make rubber mats and other goods.Tyres can also be de-vulcanised and re-converted into rubber. This is of poor quality, but it can be mixed with virgin material to produce new tyres and other consumer rubber goods. Often, landfill companies use tyres as they are in the landfill to create a drainage system. This can lead however to toxic chemicals leaching from the rubber and into water systems. This is an innovative building technique pioneered in the US and Mexico, and now being used worldwide, with several examples in Scotland and around the rest of the UK. 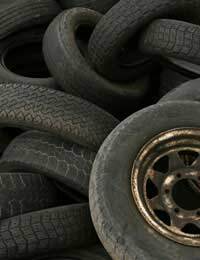 Used tyres are collected on the building site, arranged according to the architects plan, and filled with earth or sand. They are then built up to create walls, which are then plastered, and reinforced to help support the roof. Technology is being developed that can harness the energy produced from incinerating tyres. This is in the early stages, and currently there is little information available. Firstly, treating the tyres on our vehicles well is most important. The better people drive, the longer tyres will last. Check tyre pressure regularly. When the tyres do eventually wear out, consider purchasing re-treaded tyres. Also consider that cheap tyres can exacerbate the problem of tyres going into landfill. Ask your tyre retailer if they can arrange for tyres to be recycled, or processed in any of the ways mentioned above. As consumers, remember that we all have the power to change trends of manufacturing and recycling goods and materials. We can all keep tyres being thrown into landfill sites.